It isn’t going to take you very long to get the hang of playing mobile slot games, and by looking around the web to realise there are a huge and growing number of casino sites that now have a collection of games that are fully compatible with any type of mobile device. 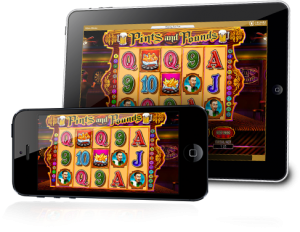 However, if you do want the best slot playing experience when playing on a mobile device, you should ideally be using a touch screen mobile device, for whilst there are some slot games that are compatible with very old mobile devices that use Java as the operating system for such games those games are not that high tech. One thing that you do need to be aware of when you are using a slot or casino app is that not all of them are going to be offering you real money games. It is worth me pointing out that some apps are only designed to be used as for entertainment purposes, and as such you are never going to be able to play the games those apps offer for real money; however, you may have to spend real money to access them! The way those apps have been designed is that when you initially download the app you are awarded with a set number of demo mode credits, and then every few hours they will be topped up if you use them all. However, in the hours in between the demo mode free play credits being topped up you are given the opportunity of buying additional free play credits using real money funds! I have yet to get my head around why any player is ever going to want to pay real money for free play credits, but there are a lot of players who do! If you do ever get the urge to play at a mobile casino site using a mobile app then my advice would be for you to find an app that offers games from more than just one single supplier. By doing so you are going to then have access to a very large and diverse range of different games many of which you will never have seen or come across before. Plus, when utilizing such an app you will find lots of brand new games going live all the time too, so there will always be plenty of new slot games to play. Bonuses are just as freely available at mobile casino sites and when you set about using mobile apps, so do not think you are going to be missing out on your fair share of bonuses and promotional offers but for the best playing value stick to claiming bonuses with no maximum cash out limits and try and select the slot bonuses that come with a reasonable play through requirement too. One final thing to have an optimal and enjoyable and value packed mobile slot playing experience, is to make sure that you are playing via a mobile casino app that has a generous comp club attached to it too.